Click the button below to purchase season tickets! Unique to North America and possibly the world, ABBA Gold is completely live and recreates ABBA’s concerts in the late 1970s and 1980s. This 10-piece show and members have performed to sold-out audiences in cities around the world. Combining vocal excellence, high energy music, costume changes and incredible choreography, ABBA Gold has the audiences singing, dancing and reminiscing about the days when they were singing their favorite ABBA songs. Included in the many songs will be “Knowing me, Knowing you”, “The Winner Takes It All”, “Mamma Mia” and “Fernando”. The incredibly successful motion picture, “Mamma Mia” featured the music of ABBA throughout the entire movie. 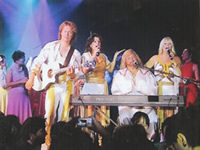 You will be mesmerized by their rendition of the songs made famous by ABBA. Lezginka, the Merited State Academy Dance Company of Daghestan, was founded in 1958. It’s dances express boundless love for one’s native land, it’s heroic and wonderful present, they reflect the power of human love, the people’s heroic struggle for their happiness and pride for their country. Each concert is a festival of dance, elegance and beauty. The Lezginka Ensemble has been performed with invariable success in the cities of Russia and in many European and Asian countries. It’s dances and music will thrill you and keep you in a trance throughout the performance. Guy Lombardo’s name has become so legendary in music circles that critics remarked that he could fill auditoriums, nightclubs, theaters, dance halls and sell millions of records each year. The musical sound has been described as “The Sweetest Music This Side of Heaven”. Some of the tunes made famous are, “Seems Like Old Times”, “Boo Hoo”, “Coquette”, “Sweethearts on Parade” and “Ain’t She Sweet”. You will hear many beautiful Christmas songs and songs made famous by the band to be remembered for a lifetime. Jazz is the single art form America has given the world. When you hear the Southern Fried Jazz Band perform their infectious beat of Dixieland classics you will be up in your seats and in the aisles. Jazz is especially reflective of our nation’s personality and spirit. Along with performing music that is an historic part of America’s soundtrack, the band also has programs for younger audiences to spark their interest in good jazz. The concert blends music with narrations and personal anecdotes into a seamless history lesson of jazz in America. Instrumentals are accented with vocals and stirred with lots of seasoning and spontaneity into a tasty recipe that never fails to “WOW” its audience. Some of the songs on the program will include, “Down by the Riverside”, “Bill Baily”, Some Day You’ll be Sorry”, “Sweet Georgia Brown”, “Rockabye My Baby” and many more accompanied by lovely vocal renditions. Visit the sights and sounds of the KING OF ROCK-N-ROLL’s most spectacular concert at the Honolulu International Convention Center. This is a production with a cast of 15, bringing to life the KING’s greatest moments from the January 1973 concert. You will hear many of his hits from the movies of Blue Hawaii, Paradise Hawaiian Style, Aloha from Hawaii and many more. You will be entertained by Polynesian dancers along with comedy and many of the islands’ customary greetings. It features Don Rose (voted the best ELVIS in Las Vegas) as the KING OF ROCK-N-ROLL and the Polynesian troupe, HOT LAVA.